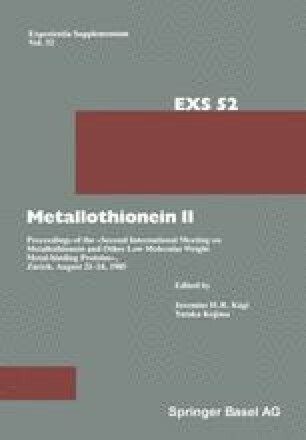 A wealth of chemical, spectroscopic and structural data attest to the uniqueness of the metallothioneins as a group of novel bioinorganic structures. Their earmarking feature is the arrangement of “soft” metal ions in complexes with cysteine side chains to form discrete metal-thiolate clusters. In this review an account is given of the chemical characteristics of the 52 metallothioneins whose primary structures are now known completely or in part. Also included is an up-to-date summary of the spectroscopic properties and of the spatial structure models derived from X-ray diffraction crystallographic analysis and from two-dimensional nuclear magnetic resonance spectroscopy.